In biology, detritus is dead organic material, as opposed to living organisms or inorganic matter. However, what specifically is included as detritus varies according to different researchers, with some restricting the term to only non-living particulate organic matter (POM), while others also include dissolved organic matter (DOM), and yet others include the associated microbial decomposers. (See terminology.) Detritus is normally colonized by communities of microorganisms, which act to decompose (or remineralize) the material. In contrast with herbivory, which involves the consumption of living plants and their products, the term detritivory refers to the consumption of dead organic matter and detritivores are heterotrophs that obtain nutrients by consuming detritus (Wetzel 2001). On the individual level, the function of the various microorganisms and such detritivores as millipedes, burying beetles, and fungi, is to break down the organic materials to gain the resources required for their own survival and proliferation. However, a larger function for the ecosystem also is served in recycling the nutrients and energy. Ecosystems that are dependent on detritus as an energy and food source are known as detritus-based ecosystems (Kormondy 1969). Detritus is very important as the base of food chains and for cycling of nutrients. In forest environments, the detritus, made up of leaf litter and other organic matter, serves as an energy source for decomposers, herbivores, and carnivores; as much as ten times as much energy may flow through the detritus food chain as opposed to the grazing chain or pathway (involving feeding on living plants) (Kormondy 1969). Likewise, detritus serves as the energy source for benthic ecosystems, sustaining the benthic food chain. Humus is the organic material in soil. Humus has a characteristic black or dark brown color. In general, detritus is non-living organic matter. In derives from the Latin detere, meaning "to disintegrate" or "diminish" (Day et al. 1989, 282). In terrestrial ecosystems, detritus typically includes the leaf litter and other organic matter intermixed with soil, here known as humus. For pragmatic reasons, some scientists include the associated microbiota as part of the detritus (Day et al. 1989). In aquatic systems, organic matter can be differentiated into particulate organic matter (POM) and dissolved organic matter (DOM). The terms particulate organic carbon (POC), dissolved organic carbon (DOC), and total organic carbon (TOC) also are used. The definition of detritus in aquatic systems varies according to the researcher. Some researchers, such as Paerl (1974), restrict the term detritus to POM. Others, such as O'Reilly and Dow (2006) and Wetzel (2006) consider detritus to be both POM and DOM. For example, O'Reilly and Dow (2006) state "the combined DOC + POC is often referred to as 'detritus'." The term detritus was originally defined by Odum and de la Cruz (1967), who considered detritus to be dead particulate organic matter inhabited by decomposing organisms (Day et al. 1989). Mann (1972) and Day et al. (1989) consider detritus to be all non-living organic matter and the associated microbial community. Again, this is done for pragmatic reasons, as it is difficult for a scientist or a consuming organism to differentiate between the dead organic matter and the associated microorganisms (Day et al. 1989). Detritivores, also known as detritus feeders, are heterotrophs that obtain nutrients by consuming detritus (decomposing organic matter) (Wetzel 2001). By doing so, they contribute to decomposition and the nutrient cycles. Detritivores are an important aspect of many ecosystems. They can live on any soil with an organic component, and even live in marine ecosystems where they are termed interchangeably with bottom feeders. 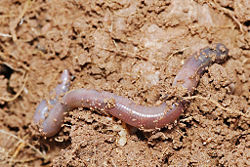 Typical detritivorous animals include millipedes, woodlice, dung flies, many terrestrial worms, burying beetles, some sedentary polychaetes such as amphitrite, terebellids, and fiddler crabs. Many species of bacteria, fungi, and protists, while unable to ingest discrete lumps of matter, instead live by absorbing and metabolizing on a molecular scale. Scavengers are typically not thought to be detritivores, as they generally consume larger quantities of organic matter. In food webs, detritivores generally play the role of decomposers. Detritivores are often eaten by consumers and therefore commonly play important roles as recyclers in ecosystem energy flow and biogeochemical cycles. Dead plants and animals, material derived from body tissues such as dead skin cast off, and matter derived from organisms in the form of excreta all gradually lose their form, due to both physical processes and the action of decomposers, such as bacteria and fungi. Decomposition, the process through which organic matter is reduced to simpler forms of matter, takes place in many stages. Materials like proteins, lipids and sugars with low molecular weight are rapidly consumed and absorbed by microorganisms and organisms that feed on dead matter. Other compounds, such as complex carbohydrates are broken down more slowly. In breaking down the organic materials, microorganisms gain the resources required for their own survival and proliferation. At the same time that the materials of plants and animals are being broken down, the materials (biomass) making up the bodies of the microorganisms are built up by a process of assimilation. When microorganisms die, fine organic particles are produced, and if these are eaten by small animals that feed on microorganisms, they will collect inside their intestines, and change shape into large pellets of dung. As a result of this process, most of the materials from dead organisms disappears from view and is not obviously present in any recognizable form, but is in fact present in the form of a combination of fine organic particles and the organisms using them as nutrients. This combination is detritus. 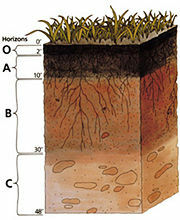 In ecosystems on land, detritus is deposited on the surface of the ground, taking forms such as the humic soil beneath a layer of fallen leaves. In aquatic ecosystems, much detritus is suspended in water, and gradually settles. In particular, many different types of material are collected together by currents, and much material settles in slowly-flowing areas. Much detritus is used as a source of nutrition for animals. In particular, many bottom-dwelling animals (benthos) living in mud flats feed in this way. In particular, since excreta are materials which other animals do not need, whatever energy value they might have, they are often unbalanced as a source of nutrients, and are not suitable as a source of nutrition on their own. However, there are many microorganisms that multiply in natural environments. These microorganisms absorb nutrients from these particles. In practical terms, the most important constituents of detritus are complex carbohydrates, which are persistent (difficult to break down), and the microorganisms that multiply using these absorb carbon from the detritus, and materials such as nitrogen and phosphorus from the water in their environment, to synthesize the components of their own cells. A characteristic type of food chain called the detritus cycle takes place involving detritus feeders (detritivores), detritus, and the microorganisms that multiply on it. For example, mud flats are inhabited by many univalves, which are detritus feeders, such as moon shells. When these detritus feeders take in detritus with microorganisms multiplying on it, they mainly break down and absorb the microorganisms, which are rich in proteins, and excrete the detritus, which is mostly complex carbohydrates, having hardly broken it down at all. At first this dung is a poor source of nutrition, and so univalves pay no attention to it, but after several days, microorganisms begin to multiply on it again, its nutritional balance improves, and so they eat it again. Through this process of eating the detritus many times over and harvesting the microorganisms from it, the detritus thins out, becomes fractured and becomes easier for the microorganisms to use, and so the complex carbohydrates are also steadily broken down and disappear over time. The primary microorganisms that break down matter are called mesophilic (microorganisms thriving at medium temperatures). They cause a lot of heat, which is why compost becomes warm after a while. There are an extremely large number of detritus feeders in water. After all, a large quantity of material is carried in by water currents. Even if an organism stays in a fixed position, as long as it has a system for filtering water, it will be able to obtain enough food to get by. Many rooted organisms survive in this way, using developed gills or tentacles to filter the water to take in food, a process known as filter feeding. In contrast, from the point of view of organisms using photosynthesis, such as plants and plankton, detritus reduces the transparency of the water and gets in the way of their photosynthesis. However, given that they also require a supply of nutrient salts, in other words fertilizer for photosynthesis, their relationship with detritus is a complex one. In land ecosystems, the waste products of plants and animals collect mainly on the ground (or on the surfaces of trees), and as decomposition proceeds, plants are supplied with fertilizer in the form of inorganic salts. However, in water, relatively little waste collects on the water bed, and so the progress of decomposition in water takes a more important role. However, investigating the level of inorganic salts in sea ecosystems shows that, unless there is an especially large supply, the quantity increases from winter to spring but is normally extremely low in summer. In line with this, the quantity of seaweed present reaches a peak in early summer, and then decreases. This is thought to be because organisms like plants grow quickly in warm periods and the quantity of inorganic salts is not enough to keep up with the demand. In other words, during winter, plant-like organisms are inactive and collect fertilizer, but if the temperature rises to some extent, they use this up in a very short period. However, it is not the case that their productivity falls during the warmest periods. Organisms such as dinoflagellate have mobility, the ability to take in solid food, and the ability to photosynthesize. This type of microorganism can take in substances such as detritus to grow, without waiting for it to be broken down into fertilizer. When animals such as fish are kept in an aquarium, substances such as excreta, mucus and dead skin cast off during molting are produced by the animals and, naturally, generate detritus, and are continually broken down by microorganisms. If detritus is left unattended, it dirties the inside of the water tank, and harms the health of the animals inside. Sea-dwelling animals, in particular, have little resistance to the toxins that are produced by the decomposition of detritus. Modern sealife aquariums often use the Berlin system, which employs a piece of equipment called a protein skimmer, which produces air bubbles which the detritus adheres to, and forces it outside the tank before it decomposes, and also a highly porous type of natural rock called live rock where many bentos and bacteria live (hermatype that has been dead for some time is often used), which causes the detritus-feeding bentos and microorganisms to undergo a detritus cycle. The Monaco system, where an anaerobic layer is created in the tank, to denitrify the organic compounds in the tank, and also the other nitrogen compounds, so that the decomposition process continues until the stage where water, carbon dioxide, and nitrogen are produced, has also been implemented. Initially, the filtration systems in water tanks often worked as the name suggests, using a physical filter to remove foreign substances in the water. Following this, the standard method for maintaining the water quality was to convert ammonium or nitrates in excreta, which have a high degree of neurotoxicity, but the combination of detritus feeders, detritus, and microorganisms has now brought aquarium technology to a still higher level. Day, J. W., C. A. S. Hall, W. M. Kemp, and A. Yáñez-Arancibia. 1989. Estuarine Ecology. John Wiley and Sons. ISBN 0471062634. Kormondy, E. J. 1969. Concepts of Ecology. Englewood Cliffs, NJ: Prentice-Hall. Mann, K. H. 1972. Macrophyte production and detritus food chains in coastal waters. Mem. Ist. Ital. Idrobiol. 29 Suppl. : 353-383. Odum, E., and A. de la Cruz. 1967. Particulate organic detritus in a Georgia salt marsh-estuarine ecosystem. Pages 383-388 in G. Lauff (ed. ), Estuaries. Am. Assoc. Ad. Sci. Pub. 83. Washington, DC. O'Reilly, J. E., and D. D. Dow. 2006. Detritus: Particulate organic carbon (POC) and dissolved organic carbon (DOC). Pages 107-109 in J. S. Link, C. A. Griswold, E. T. Methratta, and J. Gunnard, eds., Documentation for the Energy Modeling and Analysis eXercise (EMAX). US Dep. Commer., Northeast Fish. Sci. Cent. Ref. Doc. 06-15. Retrieved August 29, 2008. Paerl, H. W. 1974. Bacterial uptake of dissolved organic matter in relation to detrital aggregation in marine and freshwater systems. Limnology and Oceanography 19(6): 966-972. Retrieved August 28, 2008. Wetzel, R. G. 2006. Death, detritus, and energy flow in aquatic ecosystems. Freshwater Biology 33(1): 83-89. Wetzel, R. G. 2001. Limnology: Lake and River Ecosystems. San Diego, CA: Academic Press. ISBN 0127447601. This page was last modified on 5 September 2008, at 18:46.